This post is going to be less about the film itself and more about the cool connections I have with it. Yes, you read that correctly. As you all know, this movie was filmed at the Fitzgerald Theater in St. Paul, Minnesota, where the radio show A Prairie Home Companion usually broadcasts on Saturday evenings. Garrison Keillor hosts the show and also leads this ensemble cast which takes place on the night of the show's last performance. Putting it mildly, it's pretty boring. Ok, so what are the aforementioned connections? First and foremost, I was an extra in this movie. You probably can't pick me out in the theater seats in the film, but I lived in a suburb of St. Paul during grad school in 2005 and when I found out that they were accepting extras, I made my friend Steph go with me to see if we could get in. We did get to sit in the theater as part of the audience during the filming of the "black coffee" segment. We walked right past Woody Harrelson, John C. Reilly, Kevin Kline, and Maya Rudolph. 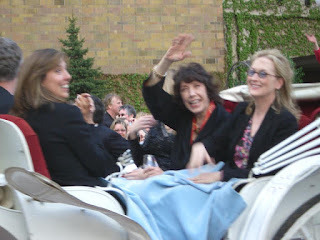 Sadly, Meryl was not filming that day, but I had to take a chance at getting a glimpse of her. I joke that Lily is raising her hand to smack someone. I was not able to attend because I couldn't make it over to St. Paul in time from work. In hindsight that seems like such a lame excuse. Anyway, the third connection I have is that Joe used to be Garrison Keillor's personal assistant. Joe had answered a very benign ad on Cragslist for a "busy man" looking for an assistant and it ended up being a famous person. Joe claims that he was terrible at the job and it only lasted a few months, but it's still a cool story, if for no other reason than to mention it here. The final connection is that about six or seven years ago, one of my friend's boyfriend had moved into an apartment/house somewhere in Minneapolis. Behind a stone in the fireplace he found Garrison Keillor's draft card. Apparently Keillor was a conscientious objector during the Vietnam War and he meant to burn his draft card in the fireplace of that home. My friend emailed Keillor, who corroborated the story and declined to have the card sent to him. How weird! So, although the film is sort of a snooze, it's fun to know it was filmed near my home. At the end of the movie the cast even gets together at the famous Mickey's Diner in St. Paul, where I've had the pleasure of enjoying a good burger. I should also mention that this was the great Robert Altman's last film, as he passed away in November, 2006, just a few months after the film was released. I remember him being up on a seat attached to a moveable crane at the back of the theater during filming. I didn't appreciate it at the time, but as I'm so on in years now (ha), I realize how fortunate I was to have been a part of it. Correction: I lasted just one month. I was a bumbling idiot so I fired myself. Plus, I got into graduate school so that was an easy out. "Great Hope Springs" title change?